We have products that solve specific needs in industrial automation. Thousands of customers have successfuly used the products to solve their development and system integration tasks, ranging from simple to very complex. OPC Labs products support major OPC standards. QuickOPC compliance has been verified by rigorous tests performed by OPC Foundation. Download the product or documentation by simply clicking on the appropriate link. We do not require you to register with the site or fill in any forms. All commercial products downloaded from here function as a free trial, unless you purchase a license. We can provide you with evaluation license that will relax or lift the limitations, if you need it for verification that the product is right for you. In such case, please contact us and explain your situation. This page contains only installation packages for current versions of our products. 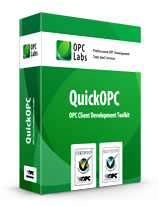 QuickOPC is a suite of OPC Client Development Components for COM and .NET: Download its free fully-functional trial here. OPC "Classic" (COM/DCOM-based), OPC XML, and OPC Unified Architecture (Web service-based) specifications are supported. The free trial provides valid data to client application for 30 minutes; after that period, the component needs to be re-started. The free trial may also be limited by an absolute date in the future, usually set several months from the current date. The installation also contains usage examples for QuickOPC product in various programming languages, and also tools and other material related to the product. For more product information, see QuickOPC product page. QuickOPC is an ideal tool to integrate OPC connectivity to custom applications. QuickOPC allows you to develop OPC clients in a wide range of tools and programming languages. Besides traditional procedural programming, the components provide various time-saving features, such as Live Binding and Live Mapping, and also contain a ready-made set of rich user interface controls and dialogs, e.g. for information browsing and discovery in the OPC world. ... allows you to bring in streaming data from OPC sources into StreamInsight, analyze them and process them further, and feed the results back. OPC data can be combined with data from multiple other sources. You can monitor the OPC data for meaningful patterns, trends and exceptions, and analyze and correlate them while they are in-flight. The StreamInsight Option is contained in the main QuickOPC installation package, including a free trial. The Excel Option for QuickOPC allows you to set up a communication link between Excel and any OPC server. It is possible to subscribe to and view real-time data, and also write the data back. No programming, macros or add-ins are necessary. With just drag-and-drop or copy-and-paste, you can create Microsoft Excel sheets with live, animated OPC data. 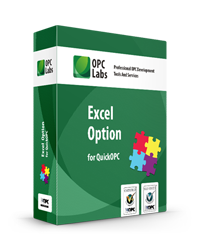 The Excel Option is contained in the main QuickOPC installation package, and you can try it out for free. PicoOPC for .NET is available as NuGet package from www.nuget.org.